Effective management of contaminated sediments is a complex and challenging process that may involve a range of alternatives. An integration of AquaBlok® with more conventional management technologies may offer the best solution. An AquaBlok-based approach generally involves in-situ capping and/or treatment to affect mass reduction of encapsulated contaminants (as shown in the graphics below). In practice, AquaBlok materials are often combined with alternative approaches. Larger and more complex sites that combine remedial technologies may offer the most cost-effective risk-reduction. In terms of environmental impact, the most critical issue related to contaminated sediment is not necessarily the presence of relatively high concentrations of contaminants at a given point in time, but rather the progressive and long-term effects that sediment-borne contaminants can have on exposed aquatic and even terrestrial food chains. Many contaminants can accumulate in receptor tissues throughout the food chain, resulting in the buildup of contaminants to potentially toxic concentrations in mid-to-higher-order organisms, including humans. Because of the biomagnification of this long-term process, contaminants occurring at even relatively low concentrations in sediments can pose as much of a risk to exposed ecological and human receptors, based on total toxicity potential, as can higher contaminant concentrations, over smaller ones. In recent years, the need for remediating, or managing, contaminated sediments has become evident. Contaminated sediments can be removed by dredging and treated and disposed of ex-situ, as appropriate. The time to design, mobilize, and execute large removal actions can be extensive. The sediments can also be managed in place, or in-situ. In situ management approaches can include Monitored Natural Recovery, capping, and/or treatment by biological or chemical means. Environmental dredging can be an appropriate remedy for managing contaminated sediments at many sites. However, due to limitations in effective dredging depths and the potential need for treating and disposing of large volumes of sediment and related pore waters, costs associated with dredging lower concentrations of contamination dispersed over larger areas, for the purpose of reducing exposure and total toxicity potential, can be orders of magnitude greater than when dredging to remove the same contaminant mass occurring at higher concentrations in smaller areas. This presents a strong argument for interim capping of hot spots to prevent dispersion while awaiting final action. Traditional regulatory programs designed to address contaminated media rely heavily on an iterative investigation and feasibility analysis approach that can take years to conduct, prior to initiating actual cleanup efforts. While studies are being completed and debates are conducted on the relative benefits of environmental dredging, capping, or natural recovery for managing sediments, sediment contaminants are potentially dispersing from smaller, more concentrated areas to relatively larger, less concentrated areas. Even a single storm event can cause significant dispersion of sediments. In terms of biological exposure and total toxicity potential, this equates to an increase in impacted areas needing management. Sediment capping by placing clean materials over contaminated sediments is becoming more common as a technically viable approach to managing contaminated sediments in place. While capping may not be the most appropriate long-term remedy for managing contaminated sediments at some sites, capping could be considered as an interim remedy for sediment management. Having a cap in place during prolonged, remedial decision-making periods can provide immediate isolation and stabilization of sediment-borne contamination and protection for potential receptors. Sediment caps are much less expensive than dredging. Caps are easily implemented and offer immediate isolation of contaminants from potential receptors. Interim capping remedy can also be much less expensive when considering potential dredging costs to remove contaminated sediments. For example, general costs associated with implementing a typical AquaBlok-based cap within a highly impacted, one-acre area (including product, packaging, transport, and placement) could be well under $150,000. 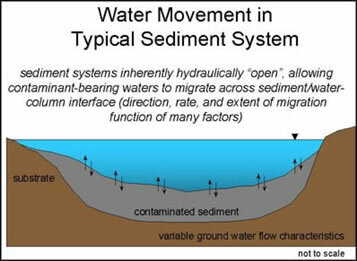 In contrast, costs for removing the same contaminant mass, once it has been dispersed over a broader area (perhaps within a single storm event) and now exists at lower concentrations and shallower sediment depths, could exceed a million dollars when costs associated with dredging, sediment de-watering, potential treatment, and disposal are collectively considered. Sediment caps have little environmental impact during and after placement. Interim caps are also a reversible solution and can be easily removed as part of a subsequent dredging-based remedy. Copyright © 2019 AquaBlok, Ltd.